OF Ichiro Suzuki (Sea) has torn up American pitching, leading the majors in hits and second in runs scored. He is also 2nd in the AL in steals. If you saw that coming in your draft, you're a better man than I (unlike you, I admit my mistakes). On top of being one of the greatest second basemen of all-time, 2B Robbie Alomar (Cle) is quietly putting together an MVP-type season: leading the AL in batting average (.358), 8th in stolen bases, 4th in on-base percentage, 4th in hits, 3rd in triples, etc. If I had to pick an MVP right now, it would be hard to choose between these two excellent ballplayers. Of course, neither will win, but, to the fundamentalists like myself, it's nice to dream. After winning the All-Star Home Run Derby, OF Luis Gonzales (Ari) surprised everyone. Who the heck is everyone? 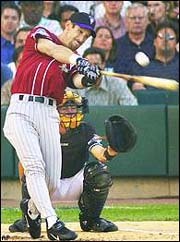 "Gonzo" has 35 home runs, a .355 batting average and 86 RBI at the All-Star break, how can that be a surprise? Forget Bonds (though he is having an outstanding HR year), Gonzo would be my MVP candidate in the NL. has had glimpses of greatness but he too has been hurting. The Diamondbacks, Phillies and Cubs are leading the NL divisions? What are YOU smoking? The Mariners are 19 games ahead of the A's and the pieced-together-like-a-bad-McGyver Red Sox continue to hang in the AL East race, while Minnesota manhandles the AL Central. There have been some REAL surprises. And forget the egomaniacal scam that the All-Star managers put on every year. C'mon, 7 Yankees? Don't get me started. In any case, enjoy the 2nd half!